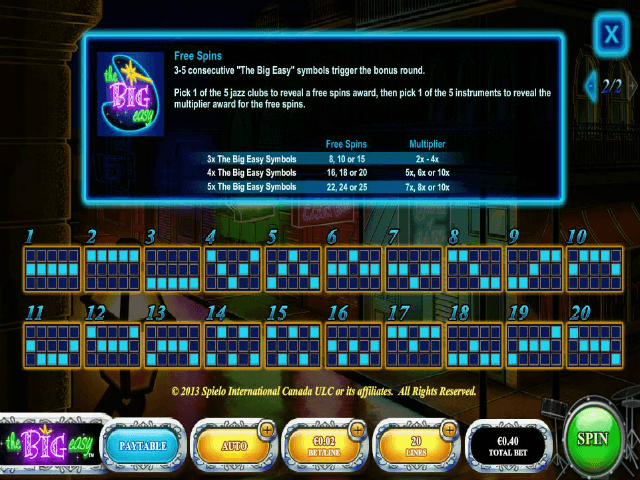 Sample a taste of New Orleans in this five-reel, 20-payline slot from IGT. 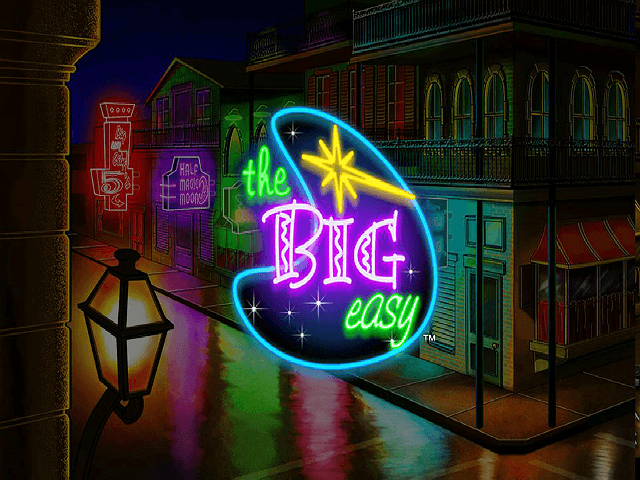 The Big Easy online slot is a colourful and easy-going slot machine with symbols that capture the culture of Louisiana’s most famous city, and a great free spins feature. 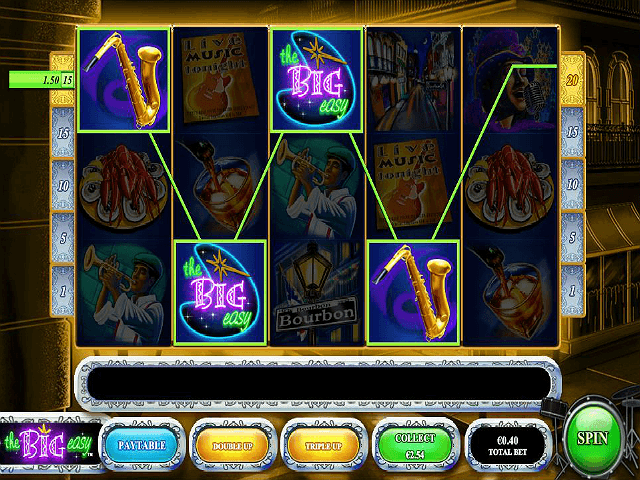 Read our review to find out more about this jazz-themed slot. This game has nothing to do with the 1987 film of the same name, but it is based on the same location: New Orleans. The city is famous for music, food, bourbon whiskey and the laid-back attitude of its residents, and IGT have encapsulated the character of New Orleans nicely with symbols including a plate of lobster, a glass of whiskey, the famous Bourbon Street sign and various musical images. The reels are illustrated in a 2D cartoon style and set against the backdrop of nighttime in the city, with only a dim streetlight making the buildings visible. There’s also a brief jazz jingle which plays every time you spin, accentuating the theme. The game itself is pretty straightforward. All 20 paylines are permanently enabled so you simply have to choose your bet. The minimum is £20 (i.e. £1 per line), which is quite high, while the maximum bet is a whopping £40,000. The Big Easy is therefore one for high rollers to consider as it can involve some big money. 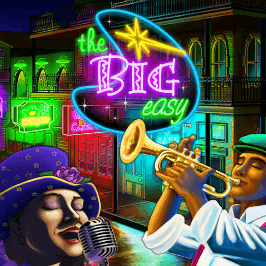 The best-paying symbols in the game are the singing woman and The Big Easy logo, which both pay out a handsome 1,000 times your line bet for landing five on a payline. Five of the moon scatter symbols award you 20 times your total bet. With the higher-paying symbols, you even get a bit of money back just for landing two on a payline. The Big Easy logo acts as the wild symbol and substitutes for all others apart from the scatter. It’s also the key to unlocking the Free Spins Bonus, which we’ll look at in the next section. Thankfully, you can retrigger the feature once by landing three or more wilds on consecutive reels on a free spin. This means you could potentially get 50 free spins with a 10x multiplier, which should bring about some hefty wins. That’s it in terms of features. 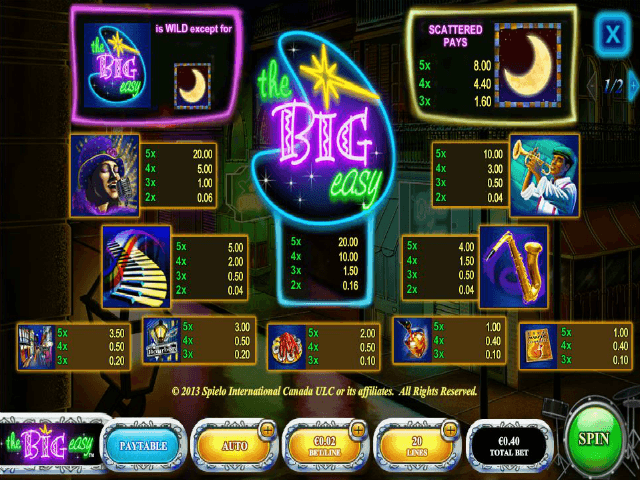 Like New Orleans itself, The Big Easy slot has a relaxed feel to it, but the Free Spins Bonus can certainly raise the pressure. If you like The Big Easy - You'll like these slots too!